Brothers and sisters, President Monson has requested that I now handle the business of the solemn assembly for which we are met. This is an occasion of great significance for members of The Church of Jesus Christ of Latter-day Saints throughout the world. The General Authorities assigned to the Tabernacle and to the Assembly Hall on Temple Square will observe the voting in those gatherings. In stake centers, a member of the stake presidency will observe the voting. Should there be any contrary votes, we ask that we be so advised. We shall now proceed with the business of this solemn assembly. The First Presidency will please arise. It is proposed that the First Presidency sustain Thomas Spencer Monson as prophet, seer, and revelator and President of The Church of Jesus Christ of Latter-day Saints. It is proposed that the First Presidency sustain Henry Bennion Eyring as First Counselor and Dieter Friedrich Uchtdorf as Second Counselor in the First Presidency of the Church. Those in favor may manifest it. It is proposed that the First Presidency sustain Boyd Kenneth Packer as President of the Quorum of the Twelve Apostles. It is proposed that the First Presidency sustain as members of the Quorum of the Twelve Apostles: Boyd K. Packer, L. Tom Perry, Russell M. Nelson, Dallin H. Oaks, M. Russell Ballard, Joseph B. Wirthlin, Richard G. Scott, Robert D. Hales, Jeffrey R. Holland, David A. Bednar, Quentin L. Cook, and D. Todd Christofferson. It is proposed that the First Presidency sustain the counselors in the First Presidency and the Twelve Apostles as prophets, seers, and revelators. The First Presidency will be seated. We invite Elder Christofferson to now take his place with the Quorum of the Twelve. The members of the Quorum of the Twelve Apostles, please arise. It is proposed that the Quorum of the Twelve Apostles sustain Thomas Spencer Monson as prophet, seer, and revelator and President of The Church of Jesus Christ of Latter-day Saints, together with his counselors and members of the Quorum of the Twelve as they have been presented and voted upon by the First Presidency. All in favor, please manifest it. The members of the First and Second Quorums of the Seventy and the Presiding Bishopric will please arise. It is proposed that the members of the Quorums of the Seventy and the Presiding Bishopric sustain Thomas Spencer Monson as prophet, seer, and revelator and President of The Church of Jesus Christ of Latter-day Saints, together with his counselors and members of the Quorum of the Twelve as they have been presented and voted upon by the First Presidency. The following will please arise wherever you may be participating around the world: all Area Seventies, ordained patriarchs, and all members of high priests and elders quorums. It is proposed that Thomas Spencer Monson be sustained as prophet, seer, and revelator and President of The Church of Jesus Christ of Latter-day Saints, together with his counselors and members of the Quorum of the Twelve Apostles as they have been presented and voted upon. Any opposed may manifest it. Will all of the Aaronic Priesthood please arise—that is, all ordained priests, teachers, and deacons. It is proposed that Thomas Spencer Monson be sustained as prophet, seer, and revelator and President of The Church of Jesus Christ of Latter-day Saints, together with his counselors and members of the Quorum of the Twelve Apostles as previously presented and voted upon. All in favor may please indicate by the uplifted hand. Any opposed may so indicate. Will all members of the Relief Society—that is, all women 18 years of age and older—please arise. It is proposed that Thomas Spencer Monson be sustained as prophet, seer, and revelator and President of The Church of Jesus Christ of Latter-day Saints, together with his counselors and members of the Quorum of the Twelve Apostles as previously presented and voted upon. All in favor, please indicate by the uplifted hand. Any opposed may so indicate it. Will the young women—that is, all young women ages 12 to 18—please arise. Now, will the entire membership, wherever assembled, including all of those who have stood previously, please arise. It is proposed that we sustain Thomas Spencer Monson as prophet, seer, and revelator and President of The Church of Jesus Christ of Latter-day Saints, together with his counselors and members of the Quorum of the Twelve Apostles as they have been presented and voted upon. You may all be seated. We shall now remain seated as we release and sustain other General Authorities, Area Seventies, and general auxiliary presidencies of the Church. It is proposed that we release Elder D. Todd Christofferson as a member of the Presidency of the Quorums of the Seventy. Those who can join with us in a vote of appreciation, please manifest it. It is proposed that we release the following as Area Seventies effective May 1, 2008: A. Venâncio Caleira, Marco A. Cardenas, José A. Castro, Gérald Caussé, Luis G. Chaverri, Timothy J. Dyches, Jaime Ferreira, José A. García, Francisco I. Gímenez, Carlos A. Godoy, James J. Hamula, Frederick C. Ihesiene, Glen O. Jenson, Robert Koch, Kuen (Tony) Ling, Richard D. May, Ross H. McEachran, Yasuo Niiyama, Timothy M. Olson, Fernando D. Ortega, Luigi S. Peloni, Rafael E. Pino, Gelson Pizzirani, Alejandro M. Robles, Gerold Roth, M. Gonzalo Sepúlveda, Su Kiong Tan, Anthony R. Temple, Larry Y. Wilson, Tsung Ting (Jared) Yang, Willy F. Zuzunaga. Those who wish to join us in expressing our gratitude for their excellent service, please manifest it. It is proposed that we release Sisters Susan W. Tanner, Elaine S. Dalton, and Mary N. Cook as the Young Women general presidency. We also release all members of the Young Women general board. All who wish to join us in expressing appreciation for their excellent service and devotion, please manifest it. It is proposed that we sustain Elder L. Whitney Clayton as a member of the Presidency of the Quorums of the Seventy. Those opposed, if any, may manifest this too. It is proposed that we sustain as new members of the First Quorum of the Seventy William R. Walker, Craig C. Christensen, Marcos A. Aidukaitis, Gérald Caussé, Lawrence E. Corbridge, Eduardo Gavarret, Carlos A. Godoy, James J. Hamula, Allan F. Packer, Kevin W. Pearson, Rafael E. Pino, Gary E. Stevenson, José A. Teixeira, F. Michael Watson, and Jorge F. Zeballos and as new members of the Second Quorum of the Seventy Tad R. Callister and Kent D. Watson. If there be any contrary, by the same sign, please. It is proposed that we sustain the following as new Area Seventies: Pedro E. Abularach, Koichi Aoyagi, Juan C. Barros, Colin H. Bricknell, Victor Kah Keng Chen, Kuo Chiang Chung, J. Devn Cornish, Wynn R. Dewsnup, Matthew J. Eyring, G. Guillermo Garcia, Robert C. Gay, Alfredo L. Gessati, James B. Gibson, Julio C. González, Paulo H. Itinose, Douglas W. Jessop, Faustino López, Declan O. Madu, Per G. Malm, Fernando Maluenda, James B. Martino, Sergiy N. Mikulin, Abelardo Morales, W. T. David Murray, Satoshi Nishihara, Norbert K. Ounleu, Michael D. Pickerd, Anatoly K. Reshetnikov, William F. Reynolds, Michael A. Roberts, Fernando A. R. Da Rocha, A. Ricardo Sant’Ana, Robert B. Smith, Ysrael A. Tolentino, Ruben D. Torres, J. Romeo Villarreal, Louis Weidmann, Chi Hong (Sam) Wong. All in favor, please signify. It is proposed that we sustain Elaine S. Dalton as the new general president of the Young Women with Mary N. Cook as first counselor and Ann M. Dibb as second counselor. Any opposed may so signify. It is proposed that we sustain the other General Authorities, Area Seventies, and general auxiliary presidencies as presently constituted. 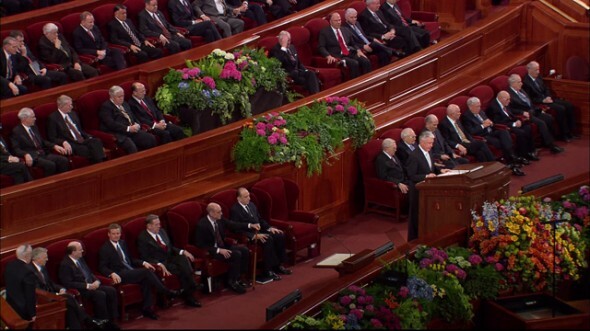 President Monson, insofar as I have been able to observe, the voting in the Conference Center has been unanimous in favor of the proposals made. Thank you, brothers and sisters, for your sustaining vote, your faith, devotion, and prayers. We invite the newly called members of the Seventy and the Young Women general presidency to come forward and take their places on the stand.